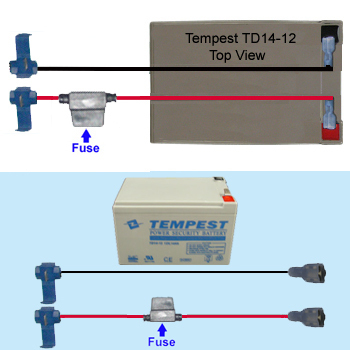 This 12 volt, 14 Ah come with 8 inchs 2 Quick Splice Connectors and 1 inline Fuse. This Battery is for Power Wheels Kid Jeep. Length 5.94", Width 3.86", Height 3.74" (Total Height 3.98"), F2 terminals .250", Approx Weight 9 lbs. 4 Year Service Life/ 2 Year Warranty Under Float Service @77°F.